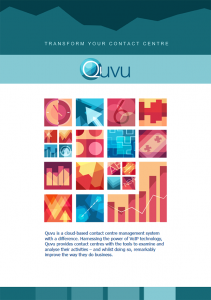 The Benefits of Call Centre Software for Sales Teams - Do you Quvu? We have years of experience working with businesses to improve how they connect with customers and increase their sales. One thing we’ve noticed from time-to-time is businesses that have internal sales teams on the phones running tele-sales campaigns often don’t consider themselves to be a call centre. That is fine, because the two aren’t usually one and the same. Internal sales teams within small to medium enterprises (SMEs) will typically have a more varied role than your standard agent working in a large call centre. However, if you fall into this category it doesn’t mean there aren’t a multitude of benefits you could gain from swapping your legacy telephone system in favour of cloud based call centre technology. In fact, the opposite is true. For a moment lets forget about all the higher costs and overheads associated with legacy systems, and concentrate on sale. How are you working on increasing contact rates? Your agents can only pick up the phone and dial so fast. How are you analysing performance metrics? How are you monitoring and coaching agents during live calls or using past call recordings? If the answer to any of those questions – and many more – is anything other than “in real time, through my web browser, from any location at any time”, you and your sales team are missing opportunities that will help you work smarter, dramatically raise contact rates, improve agent and customer satisfaction and, ultimately, improve sales results. Whether your sales team is small, medium or large, learn exactly how you can benefit with just some of the following ways your business will be transformed. The predictive dialler works behind the scenes carrying out calculations based around the frequency at which agents become available, maximising the total numbers dialled and agent utilisation so you can increase contact rates up to and beyond 300%. Allow your sales agents to handle inbound calls efficiently, effectively and by delivering a first-class customer experience. Take control of the inbound treatment of calls on each campaign, and use features such as IVR to get calls to the correct destination at the first attempt. Turn your browser into a comprehensive statistics hub, where you can analyse the metrics you wish by having the ability to create stats from scratch in your browser. Analyse raw data or use graphical wallboards to digest agent performance and sales statistics. Having agents on blended campaigns means they can simultaneously work on inbound and outbound operations. Not only can this improve productivity, it can equip them with greater knowledge of other areas of your business that will allow them to cross-promote other relevant products or services to customers. The ability to sit at your computer and listen in to a live call or past call recording means you can support staff and identify areas for improvement, even offering in-call coaching to help an agent tie up and close a deal. Do this from anywhere you have internet availability, so you can even coach agents if you’re in a different country. Our team will be happy to answer your questions and explain how Quvu and its features benefit contact centre operations of all sizes. Free, no obligation demonstrations can be given via screen sharing during a telephone call. The following details will help us to tailor the demo to your requirements. Which contact centre solution do you currently, use if any? Image Credit:Credit: Professional ImagesFlickr: Here via HolidayextrasThis work is licensed under Creative Commons 2.0 “Attribution 2.0 Generic (CC BY 2.0)”Original image cropped. To download the help guide, simply right click the image and select ‘Save link as…’. If you just wish to view the guide in your browser, just click the image normally.